Doodh is a short film shot entirely on a mobile phone by Atlanta’s Jayesh Jhurani, a software engineer by day and a script writer and aspiring movie maker by passion. 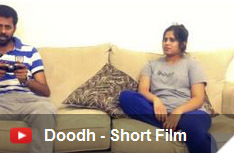 Doodh tells the story of a modern day couple where the husband wants to have tea and there is no milk at home; and what happens when he blows this silly issue out of proportion. “Since my college days, it has been my dream to write for movies. Recently, I heard about the Indian Mobile Film Festival which had the requirement that entries be shot on mobile cameras only. It gave me extra motivation to do something different from my daily life,” says Jhurani. Although, it is a 10-minute film, Jhurani had to go through what every independent film-maker goes through. Getting a cast together was the first major task. Luckily the actor, Vikas Goyal, was onboard on day 1. “I didn’t have the actress until two days before the shoot, and I was about to call off the plan. Luckily, at the last minute the actress agreed to do the film, but with a “few modifications” (sense the pun) to the script. Creative differences, managing the crew, equipment break down, anxiety issues etc- it was an emotional roller coaster,” Jhurani adds. “I wanted to write about women’s empowerment. I believe this world is dominated by men. It’s high time we start giving due credit to women,” he says. Produced under the banner of Popping Seeds.